I got distracted from my recap of our Cuba trip when I was preparing a presentation on our trip to give at local libraries. I’ve given three, so far. I’ll be doing a fourth one this afternoon and a fifth one next month. If you live in St. Louis and want to come to one of these, let me know and I’ll send you details. If you’re a librarian in the St. Louis region and think that your patrons would enjoy seeing photos and hearing about Cuba, let me know and we’ll set something up. I don’t want to leave my recap in the middle of the trip, so I’m starting it up again for Saturday Snapshot. 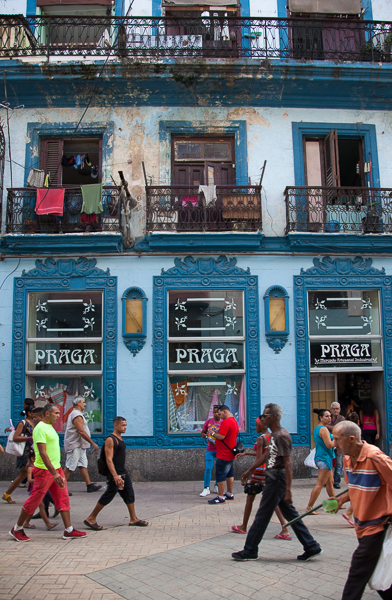 Our best photos of the whole trip came from one afternoon walk in Havana. The earlier visits to famous old plazas (Plaza de Armas and Plaza de la Catedral) came accompanied by a variety of buskers. They weren’t too aggressive but annoying after a while. Our leader decided we needed to get out where tourists are rarely seen. 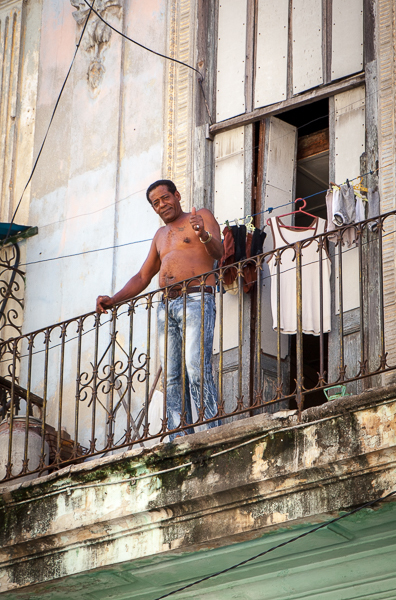 We got to see how Cubans really live and they got to look at the rare sight of a bunch of camera-wielding tourists, which seems a fair exchange for photographers who tend to get more than we give in most situations. 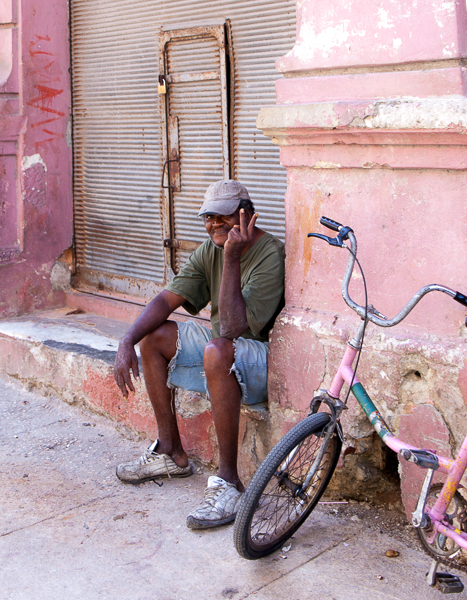 Rick took this one of a friendly Cuban. I love the colors of the bike and buildings. Another one where Rick got a positive response from a resident. 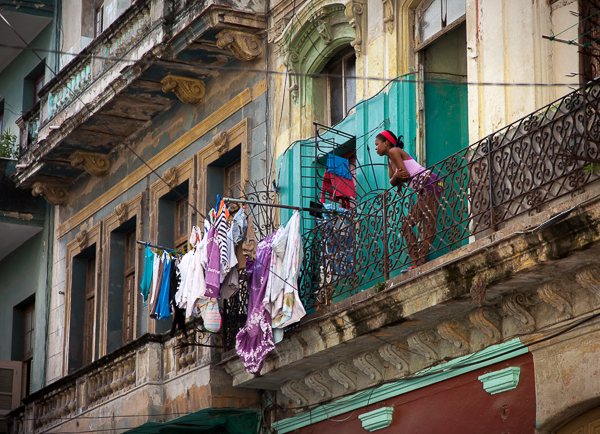 People and laundry on balconies were irresistible subjects for photographers. Part of our walk was along a busy pedestrian shopping street. This playground was closed, but the kids were in school so I hope it opened later in the day. 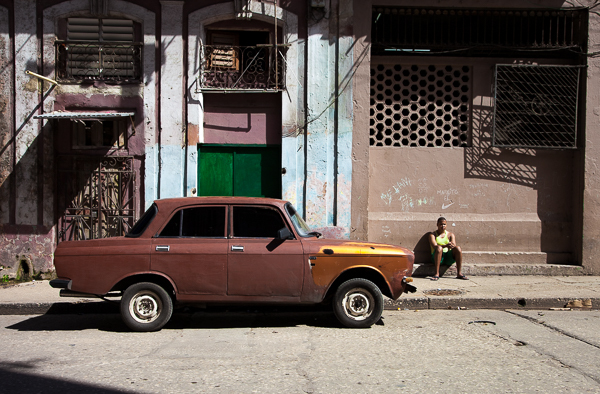 Havana is famous for 1950s American cars — but those are mostly used as taxis for tourists. On the side streets, we saw a lot of these old Soviet-era cars. El Capitolio was modeled off the Capitol building in Washington, DC. 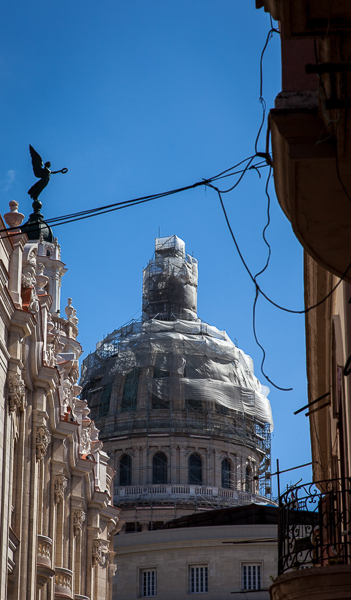 I was amused that both domes are undergoing reconstruction right now. It was originally built to house the Cuban Congress, but got re-purposed after the Revolution for the Cuban Academy of Sciences. It’s next life, after this remodel, is scheduled to be similar to the original one — a home for the National Assembly. I’ve been loving this photo series. You’re inspiring me for our upcoming trip to Cuba. Did you travel in a group the whole time or were you able to spend some time exploring on your own as well? We were with a group for the main part of the trip but we got off on our own for a couple of afternoon adventures. Great photos. 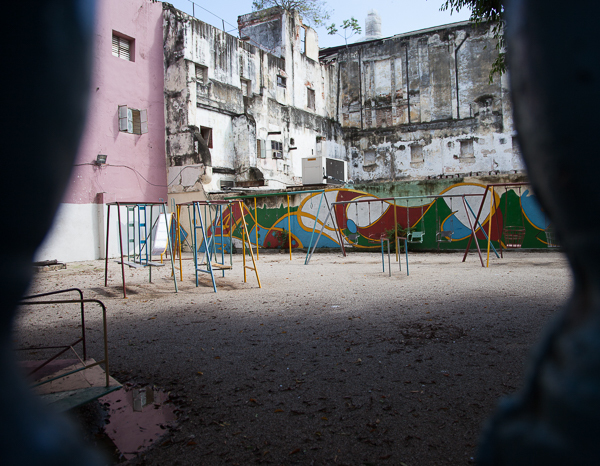 They really show the dilapidated elegance, and the character of the people. WOW! So cool that you got to go to Cuba! So did a friend of mine in Key West who is involved in the local tourism agency there. So amazing to be involved in such a historic time! Your pictures are wonderful – they pain such a vivid picture. I love the colors. Thanks for sharing!